Many, if not most, Americans see men and women as equally capable when it comes to some of the key qualities and behaviors that are essential for leadership. Being honest, holding up under pressure and standing up for what they believe in are some examples of traits that are viewed as essential for leaders in both politics and business and areas where majorities of the public say neither gender has the upper hand. In addition, while a majority of adults say male and female leaders have different leadership styles, relatively few think one gender has a better overall approach than the other. Even so, those who do see a difference between male and female leaders across a range of leadership traits and behaviors perceive women to be stronger in most areas, both in politics and business. Being compassionate and empathetic and being able to work out compromises are prominent examples of this. For their part, men are seen as being more willing to take risks. Among the public, men and women have somewhat different views about which leadership qualities are most important and about whether male or female leaders best embody those qualities. There are also wide partisan gaps. Women and Democrats are more likely to view female leaders as stronger than their male counterparts on a range of leadership qualities in both the political and business realms. A majority of Americans (57%) think men and women in top positions in business and politics are basically different when it comes to their leadership styles; 43% say they are basically the same. Among those who see a difference between men and women in this regard, most (62%) don’t think either gender is better than the other; 22% say women have a better approach and 15% say men do. Views on this differ significantly by gender and party. Women are more likely than men to see a gender gap in leadership styles (63% vs. 50%). But among both men and women who see a difference, majorities (62%) in each group say neither gender has a better approach to leadership. About one-in-four women (27%) say that women have a better approach than men, while 10% say men are better. Men are more evenly divided on this: 22% say men have a better approach, while 15% point to women. Republicans and Republican-leaning independents are somewhat more likely than Democrats and those who lean Democratic to say that men and women have different leadership styles (60% vs. 54%). 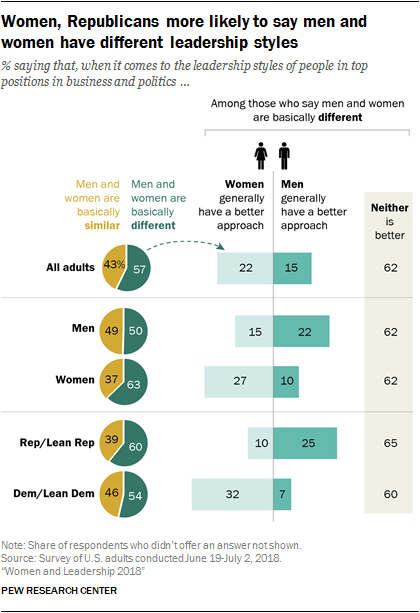 Among Republicans who see a difference, 25% say men have a better approach, 10% say women do and 65% say neither is better. Democrats who say that men and women have different leadership styles lean more heavily toward women in their assessments: 32% say women have a better approach, 7% say men are better and 60% say neither is better. Among Republicans, men and women have substantially different views on this issue. 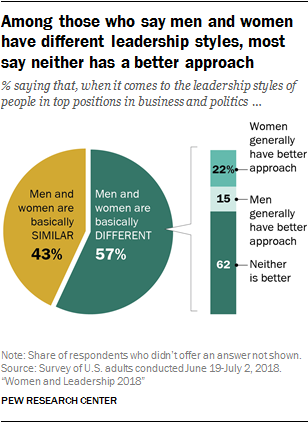 Among Republican men who see a gender gap in leadership styles, roughly a third (32%) say men have the better approach and only 6% say women have a better approach (62% say neither is better). Republican women are more evenly split: Among those who say men and women are basically different, 15% say women have a better approach and 18% point to men (67% say neither is better). Democratic men and women are more united in their views. Majorities of Americans see little difference between men and women on a range of specific qualities and competencies that may be required for effective leadership. There are a few exceptions to this, however. For example, most do see a gender difference when it comes to being compassionate and empathetic, and about half make a distinction between men and women in their ability to work out compromises. In each case female leaders are viewed as having an advantage over their male counterparts. Roughly six-in-ten adults (61%) say female political leaders do a better job at being compassionate and empathetic, and a similar share (59%) say the same about female business leaders. By contrast, only 5% say male political leaders are stronger on this dimension, and 4% say the same about men who lead in the corporate realm. Women are also viewed by those who see a gender difference as having an advantage over men in working out compromises: 42% of all adults say women in high political offices are better at this than their male counterparts, while 8% say men are better. Women have gained ground in this area since 2014. At that time, 34% of Americans said female leaders did a better job than men working out compromises, while 9% gave the edge to men. The pattern is similar for business: 42% say female executives are better at working out compromises, and 11% say men have an advantage in this area. For most of the other qualities tested in the survey, majorities of adults say there isn’t any difference between men and women. But among those who do see a difference, women tend to be viewed as stronger than men on most qualities. Two examples that apply to both politics and business are being honest and ethical and standing up for what they believe in. Roughly three-in-ten adults say female leaders do a better job than men at being honest and ethical (31% in politics and 30% in business), while relatively few say men do a better job than women (4% in politics, 3% in business). Similarly, about three-in-ten adults say women are better at standing up for what they believe in (30% for politics, 32% for business), while roughly one-in-ten say men are better (11% for politics, 10% of business). The public is more evenly divided over who does a better job working well under pressure. When it comes to politics, equal shares point to men and women (17% for each). And in business, men have a slight edge over women (22% say men are better, 14% say women). On risk taking, men are seen as stronger by a substantial margin in both politics and business among those who see a gender difference. Roughly four-in-ten adults say men are more willing to take risks (37% in politics, 41% in business), while about one-in-ten say women are better at this (9% in politics, 8% in business). Three of the qualities tested in the survey pertain more directly to politics than to business, and on two of the three, women are perceived as having an advantage over men. Roughly four-in-ten adults (41%) say women in high political offices are better than men at serving as role models; 4% say men are better at this. Women are also seen as better able to maintain a tone of civility and respect: 34% say female political leaders are better at this, while 9% point to men. When it comes to being persuasive, those who see a difference between men and women are evenly divided over who does a better job. Other qualities included in the poll were more relevant for business leaders than for politicians. Again, among those adults who see a difference between men and women in these areas, most tend to have more confidence women’s abilities. One of the largest gaps is on creating a safe and respectful workplace: 43% say female business leaders do a better job at this; only 5% say male leaders are better in this area. Female business leaders are also seen as having a relative advantage over their male counterparts when it comes to valuing people from different backgrounds (35% say women are better at this, 3% say men are better), considering the impact business decisions have on society (33% vs. 8%), providing guidance or mentorship to young employees (33% vs. 9%) and providing fair pay and good benefits (28% vs. 5%). Men have a relative advantage over women in negotiating profitable deals (28% say men are better at this, 9% say women are better). It’s important to point out that the public prioritizes these leadership qualities differently. While most are viewed by the vast majority of Americans as important for a leader, not all are seen as essential. In both politics and business, being honest and ethical is viewed as an essential leadership quality by an overwhelming majority of adults (91% say this is essential for political leadership, and 89% say it’s essential for corporate leaders). In business, creating a safe and respectful workplace is on par with honesty and ethics; 89% say it’s essential for a business leader to be able to do this. On both of these essential qualities, those who see a difference between men and women view women as better equipped. The area where women are viewed as having the greatest advantage over men – being compassionate and empathetic – is seen as less important by the public. About six-in-ten adults (58%) say it’s essential that a business leader has this quality, and 66% say the same about political leaders. The public places even less importance on being willing to take risks – the one area where men are seen as having a relative advantage over women. About four-in-ten adults (42%) say it’s essential that a business leader is willing to take risks; 45% say this is essential in politics. Men and women have different views on the extent to which male and female leaders excel on specific leadership qualities. In several cases, women are more likely than men to say that female leaders perform better, while men are more likely to say there isn’t any difference. 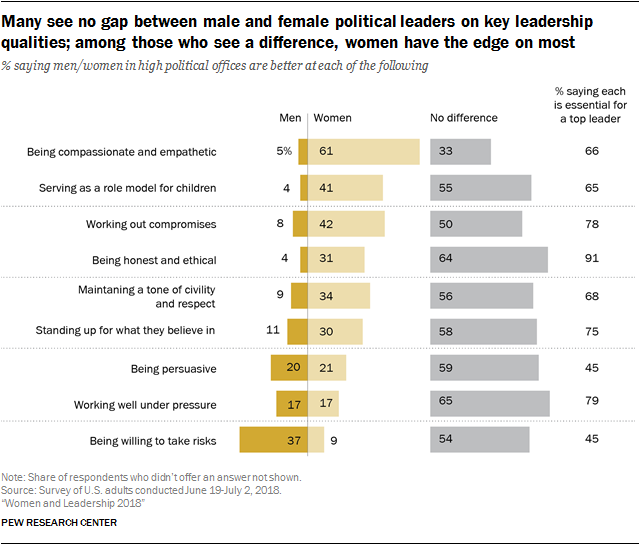 When it comes to political leadership, the gap is particularly wide on assessments of which gender does a better job at being compassionate and empathetic: 71% of women say female leaders in politics are better at this, while only half of men agree. 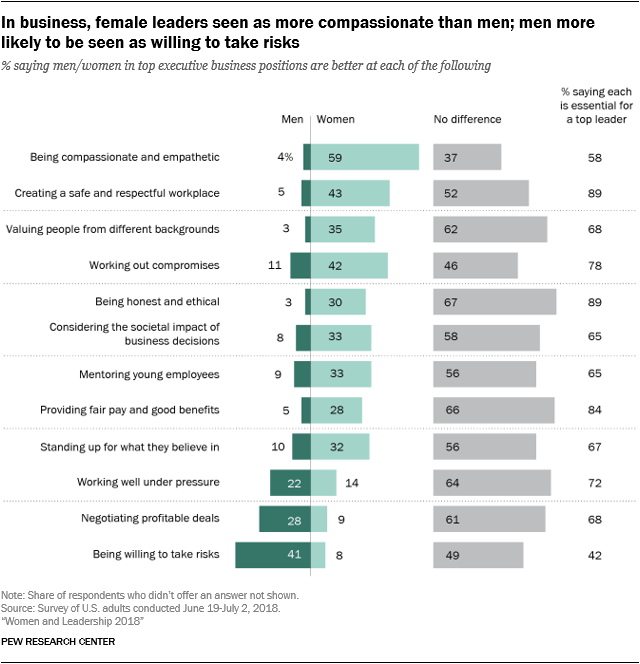 For their part, men are more likely than women to say there’s no difference between male and female leaders on compassion and empathy – 44% of men say this compared with 24% of women. The pattern is similar when it comes to maintaining a tone of civility and respect, being honest and ethical and being persuasive. In each case, women are more likely than men say that female political leaders do a better job, while higher shares of men than women say there isn’t any difference. In assessing who does a better job in the political realm working well under pressure, women are significantly more likely than men to say that female leaders do a better job in this regard, while men are somewhat more likely than women to say that men are stronger in this area. Women are also more likely than men to say that female leaders are better than male leaders at standing up for what they believe in, despite political pressure – 33% of women say this compared with 26% of men. On three of the nine dimensions tested in the poll – working out compromises, serving as a role model for children and being willing to take risks – there is no significant gender gap in the share saying that female leaders are better than their male counterparts. Across a wide range of qualities and behaviors, Democrats are significantly more likely than Republicans to say female political leaders do a better job than men. The partisan gaps in views about male and female leaders are more consistent, and in some cases wider, than the gender gaps. On each of the nine items included in the survey, Democrats are more likely than Republicans to say that female political leaders do a better job than male leaders. One of the largest gaps is in views on compassion and empathy. 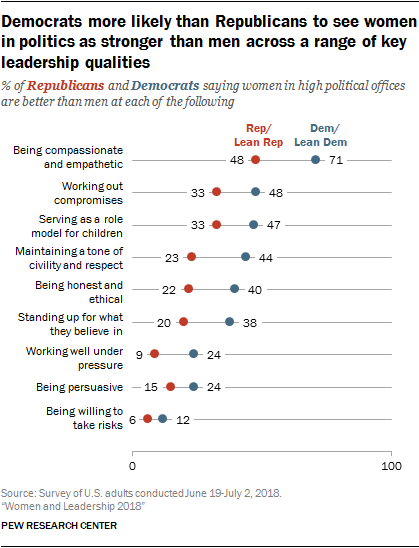 Roughly seven-in-ten Democrats (71%) say female leaders are better than male leaders at being compassionate and empathetic, while only about half (48%) of Republicans agree. Democrats are also more likely than Republicans to say female political leaders have an edge over male leaders when it comes to maintaining civility (44% of Democrats, vs. 23% of Republicans). It’s worth noting, however, that Republicans are much less likely than Democrats to say that these two qualities are essential to good leadership. Roughly three-in-four Democrats say compassion (76%) and civility (77%) are essential to good leadership, compared with smaller shares of Republicans. For their part, Republicans place more importance than Democrats on a leader’s ability to work well under pressure and stand up for what he or she believes in, despite political pressure. On each of these dimensions Republicans are more likely than Democrats to say male leaders do a better job than their female counterparts. In many cases these party differences persist even after controlling for gender. Democratic and Republican women have significantly different views on these issues, and the same can be said of Democratic and Republican men. For example, while 80% of Democratic women say that female leaders in politics are better at being compassionate and empathetic, only 56% of Republican women agree with this assessment. The pattern is similar when it comes to being honest and ethical, standing up for what they believe in, working well under pressure, being persuasive, and maintaining a tone of civility and respect. On each dimension, Democratic women are more likely than Republican women to say female political leaders do a better job than their male counterparts. Similarly, there are gaps between Democratic and Republican men on seven of the nine leadership qualities tested in the poll. One of the larger gaps among men can be seen in which gender is better able to work out compromises: 54% of Democratic men, compared with 26% of Republican men, say female political leaders do a better job than their male counterparts in this area. As is the case with political leadership, women are consistently more likely than men to say that female leaders in business are better than their male counterparts across a range of qualities and behaviors. The gap is especially wide on one item that relates specifically to corporate culture: providing guidance or mentorship to young employees. Women are roughly twice as likely as men to say that female executives do a better job mentoring young employees (43% of women say this, compared with 22% of men). Men are somewhat more likely than women to say male leaders do a better job of this (14% vs. 6%), but most men (63%) say there isn’t any difference. About half of women (48%) say that female leaders do a better job creating a safe and respectful workplace; fewer men (37%) share that assessment. Again, a majority of men say there isn’t any difference between men and women on this dimension. On other qualities and behaviors relating directly to business culture, there are not significant gaps in the shares of men and women saying that female leaders do a better job than male leaders. For example, when it comes to considering the impact of business decisions on society, roughly equal shares of men (30%) and women (36%) say that female executive do a better job. Large shares of both men (62%) and women (55%) say there’s no difference. Just as many Americans see little difference between men and women when it comes to their leadership abilities, majorities say male and female leaders are equally capable of handling several specific policy areas. The state of the economy is consistently among the public’s top policy priorities, and on this important issue, Americans see little daylight between men and women in top political leadership positions. Roughly seven-in-ten Americans (69%) say there is no difference between men and women when it comes to handling economic conditions. Smaller shares say women do a better job in this area (17%), while 13% point to men. Men are somewhat more likely than women to say male political leaders do a better job handling the economy (17% vs. 10%), and women are somewhat more likely to favor female leaders on this issue (24% vs. 10%), but large majorities of both women and men say there’s no difference. Similarly, while Republicans are more likely than Democrats to point to men as being stronger on this issue and Democrats are more likely to point to women than Republicans, at least two-thirds of each group say there isn’t any difference. When it comes to the federal budget deficit, 74% of Americans say there is no difference between men and women in high political offices in terms of their ability to deal with this policy issue. Those who do see a difference, on balance, say that women do a better job than men. Half or more of the public sees no difference between male and female leaders on the remaining four policy issues tested in the poll. Among those who do see differences, women have a slight advantage when it comes to dealing with immigration. Overall, 25% of adults say female leaders are better at handling this issue, while 13% say men are better. On gun policy, those who see a gender difference are split about evenly over who does a better job. On both of these issue areas – immigration and guns – there are large party gaps in views about which gender does a better job. Roughly one-in-four Republicans (26%) say men in political office do a better job on immigration, while virtually no Democrats hold that view (3% say men do a better job). About four-in-ten Democrats (39%) say women do a better job on this issue, compared with only 9% of Republicans. Views are similarly split along party lines when it comes to who does a better job on gun policy. Republicans are about three times as likely as Democrats to say men in political leadership do a better job on this issue (35% vs. 12%), and Democrats are roughly five times as likely as Republicans to say women do a better job on this (32% vs. 6%). When it comes to dealing with social issues such as education and health care, very few Americans (4%) see this as a strong suit for male leaders. Roughly four-in-ten (42%) say women do a better job on these issues (54% see no difference). 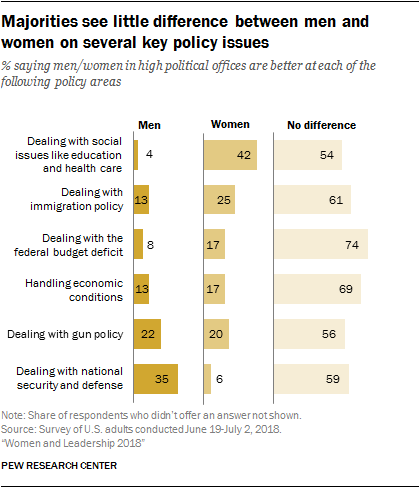 The opposite pattern holds for dealing with national security and defense – only 6% of adults say women can do a better job in this area, while 35% say men are better on these issues (59% see no difference). While women are not equally represented in the top leadership ranks of America’s largest corporations, majorities of adults say they are as capable as men of running major companies or organizations in the technology, banking and finance, health care, oil and gas and retail industries. And about half of adults (52%) don’t see either gender as better able to run a professional sports team. Still, many Americans tend to associate some industries with a specific gender. Roughly three-in-ten adults (31%) say a woman would do a better job than a man running a major retail chain. Only 6% say a man would do a better job at this. And the public is about twice as likely to say a woman would do a better job running a major hospital (19%) than to say the same about a man (8%). 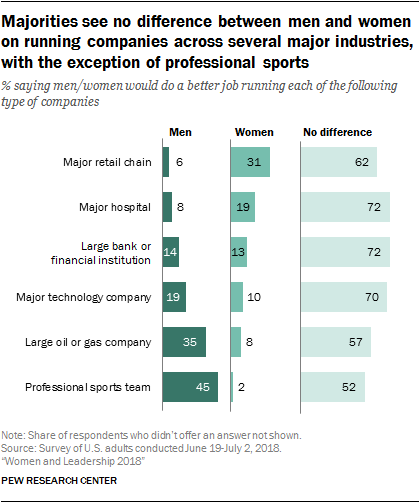 Men are seen as having a relative advantage in running a large oil or gas company: 35% say a man would do a better job at this, while 8% say a woman would be better. The gap is even wider when it comes to running a professional sports team: 45% say a man would be better at this and 2% say a woman would be better. The views of men and women are nearly identical on these measures. Assessments do not vary much by age, with one exception. Adults ages 50 and older are significantly more likely than their younger counterparts to say that a man would do a better job than a woman running a professional sports team. About half (49%) of those ages 50 to 64 and 60% of those 65 and older hold this view, compared with 36% of those younger than 50. There is no age gap in the share saying a woman could do a better job running a professional sports team, but adults younger than 50 are significantly more likely than those 50 and older to say there isn’t any difference (60% vs. 43%). In addition to the qualities and competencies that help leaders carry out their jobs, there are inherent traits that may help or hurt them on their climb to the top. Just as the public has very different views about what society values most in men and in women, the public sees some traits as being more beneficial for men than for women who aspire to leadership positions. 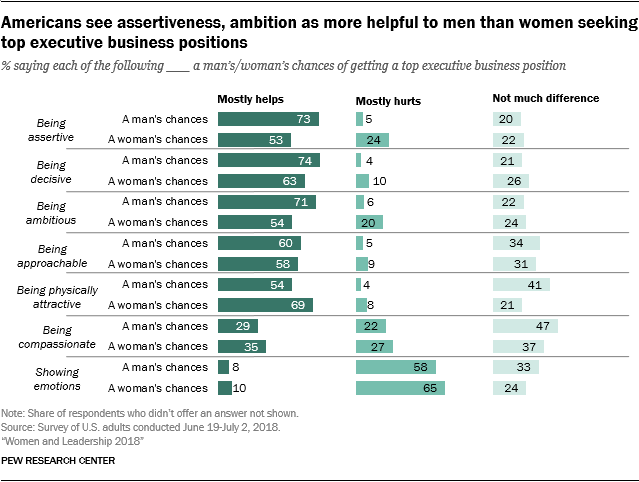 More Americans see traits like ambition, decisiveness and assertiveness as helpful for men in both politics and business, while more say that physical attractiveness helps women than say it helps men. And the public sees being compassionate as more helpful for women than men in politics, though they don’t make a distinction when it comes to business. Roughly three-quarters of adults (74%) say that being assertive mostly helps a man’s chances of getting elected to high political office; half of all adults say it helps women. In fact, one-quarter (23%) say that being assertive mostly hurts women in politics, compared with just 5% who say this about men. The results are nearly identical when it comes to men and women in business. There are large party differences in views about how being assertive impacts women politically: 61% of Republicans say being assertive helps women in politics, while about four-in-ten Democrats (41%) say the same. There is also a gender gap, with women more likely than men to say that being assertive hurts women in politics (29% of women say this vs. 16% of men). There are two additional characteristics that the public sees as more helpful for men trying to reach leadership roles in politics and business than for women with similar aspirations: ambition and decisiveness. Roughly seven-in-ten adults say ambition is a helpful trait for a man to have, while closer to half say being ambitious helps women get ahead. About one-in-five say that being ambitious mostly hurts women in both politics and business. When it comes to being decisive, roughly seven-in-ten adults say being decisive helps men to succeed in either politics or business, while 63% say this about women. One quality most adults see as helpful for both men and women seeking leadership roles is being approachable. In politics, 65% say this quality is helpful for men and 69% say it’s helpful for women. The results are similar for business. Perceptions about how physical appearance impacts men and women on their way to top leadership positions follow a different pattern. The public is more likely to see being physically attractive as an asset for women than for men. Six-in-ten adults say that being physically attractive helps women succeed in politics, and an even higher share (69%) say this helps women advance in the corporate world. Only about half say being attractive helps men get ahead (49% in politics, 54% in business). Higher shares say being physically attractive makes no difference for men than say the same for women. Only one trait is seen, on balance, as being more harmful than helpful to both men and women: showing emotions. Still, more say this hurts women seeking leadership positions than it does men. Roughly half (52%) say showing emotions hurts women in politics, and an even higher share (65%) say it hurts women in business; 39% say this hurts men in politics, 58% in business. There is a gender divide in how the public sees displays of emotions. Women are more likely than men to say that showing emotion is a liability for women. For example, about six-in-ten women (61%) say showing emotions mostly hurts women trying to get ahead in politics, while about four-in-ten men (42%) say this is the case. Women hold this view regardless of party. Similar shares of women in both parties believe that showing emotions hurts women seeking higher political office. Six-in-ten Republican women (60%) and Democratic women (62%) hold this view. And the gender gap persists in both parties. Just 39% of Republican men say showing emotions hurts women in politics – a 21-point difference from Republican women. There are significant differences in how Americans view being compassionate in the workplace and the political arena. While 46% of Americans see compassion as a positive trait for men in politics, only 29% say it mostly helps men in business. Instead, nearly half of the public (47%) says being compassionate makes no difference in helping a man get ahead, and 22% say it hurts men in the workplace. A similar pattern exists for women.